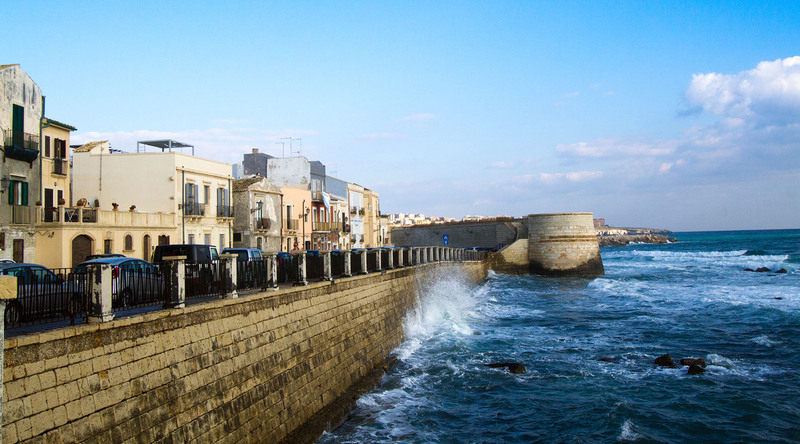 Siracusa, often called Syracuse, is a cool little place on the Sicilian island of Ortygia. As you approach the old city you have no idea what the big deal is about the destination. It looks drab, ugly, and industrial outside the old city walls. As you traverse the bridge to the island you see what all the fuss is about. There is a delightful old town to wander, ogle, and photograph. Siracusa is a true delight and a great place to spend a day. Like many towns in Sicily, Siracusa has a Piazza del Duomo. It is absolutely gorgeous. Siracusa's Duomo is more striking than others in the area which makes the Piazza a perfect place to enjoy lunch. My favorite restaurant in the Piazza, aptly named Café del Duomo, has excellent pizzas - and I do mean excellent! One site of note in the main town and is the Teatro Greco. I have to say it’s not that nice. It was completely under construction when I was there but they did not inform you at the ticket booth. They make visitors walk about a mile to buy tickets in the opposite direction of the site so they’ll have to walk through souvenir shops. Obviously, make your own decision, but I advise spending your time in the gorgeous old city of Siracusa. Another main site in Siracusa is Fontana Aretusa, a fountain that is said to be an ancient spring where fresh water still bubbles up. It’s honestly not the most impressive thing you’ll ever see but it’s an important landmark in the town. Further along on the southern tip of the island is the Castello Maniace. It looks really cool from the outside and it looks like a fort inside, as they generally seem to do in Sicily! Be sure to have a look from along the city walls on each side as well. It looks different from different angles. However, the best thing to do in Siracusa is to simply stroll around and enjoy the ambiance. It's a very charming place and you can’t help but fall in love with it. Ortygia is a small place and you can see most of it in a few hours so take your time and stroll. Have a few cappuccinos, a few scoops of gelato, and order an extra cannoli! Siracusa will win you over immediately upon stepping foot in old town. You will fall in love with the tiny streets, delightful shops, cafes, and atmosphere. Walk around, get lost and just remember, it’s a small place so you’ll never really get lost!